Last night, I’m driving down the dark, two-lane Highway 54 back to my home. I have my wife, Sally, and four-year old boy, Otto with me. Sally mentioned that there were a lot of deer around, so I was going a bit slower than normal, and trying to be alert. It didn’t matter at all. I hit a deer. Well, really, I maintain the deer hit me. This deer — whom I’m pretty sure was probably a fawn molester or possibly a member of some deer branch of the Klan or something — was an idiot. The deer leapt across the left side of the road, under cover of darkness, and crossed the lane to emerge right in front of me, driving our Scion xB. The deer was mid-leap when we contacted, impacting on the driver’s side front corner, which sent the deer pirouetting back across the oncoming lane, to stumble and slide back down into the forest. Not dead, but probably not happy. When the deer appeared in my headlights, I had just enough reaction time to get off the gas and onto the brake, a bit, but that was it. There was a big, beige, hoofed flash, and then the thud. Luckily, I didn’t swerve or lose control, mostly because I simply didn’t have time to act on any of my likely terrible reactions. As it was, I hit the deer, sent it flying, and was able to pull to a controlled stop. And, despite the terrible luck from actually hitting a deer, I was actually, in fact, lucky. I was okay, my wife and child were fine, and the plucky little xB actually took the beating remarkably well. No real mechanical damage, radiator seemed fine, and aside from the lost headlight, it drove back home without issue. This morning, I was able to really assess the damage, and, happily, it’s not terrible. Bumper cover destroyed, driver’s side fender all misshapen, and some of the body positioning brackets and the radiator mounting brackets have been bent a bit. The fender is keeping the driver’s door from opening well. Frame rails look good, no real mechanical damage, just cosmetic, for the most part. Also, just a warning to anyone who hits a deer, if you have a dog, they’ll get creepily fixated on smelling out all the little bits of deer fur and skin stuck in the car and parts you’ve pulled off. My dog thinks hitting this deer was a fantastic idea, but also thinks we dropped the ball on not dragging the (probable) carcass back with us for her to enjoy. Really, though, please be as careful as you can on dark, rural roads. 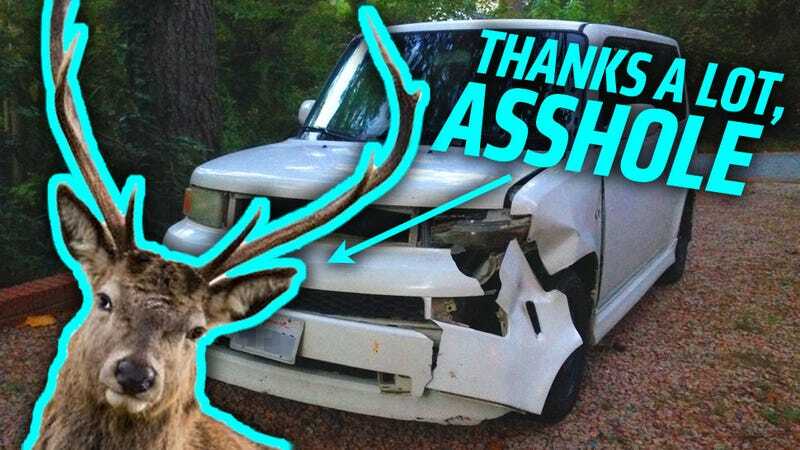 There’s very little warning with deer, but I hope no one reading this has to find that out. The bad news is that my wife, at some point, didn’t realize she cancelled the collision/comprehensive insurance on the car, so we’re on our own for this repair. Which makes it a perfect Garage project! Now, my original thought was to make a new front end that looked like an old 60s Econoline or Dodge van or something, like they do with those Kei vans in Japan. I love those. Unfortunately, this is really my wife’s car more than mine, and she wasn’t so down with that idea. So I pressed her, a bit. If we have to rebuild the front end anyway, is there anything you’d like it to look like? Happily she had an answer — and one that I think should be achievable, at least a bit: a Ford Flex. Yes, Sally likes the look of the Flex, and I can’t blame her — of all of Ford’s lineup, I think it has the most novel design. And, happily, the Scion xB looks an awful lot like a scaled-down Flex. So, I bet this is an achievable goal. I can call it the FlexB! I’m thinking, to keep this relatively cheap and easy, I’ll focus on the headlights and fake-grille panel that goes between the lights for most of the Flexization. There’s a huge amount of aftermarket lights for the xB, and I bet there’s a set that’s at least somewhat close to at least one generation of Flex. I’ll get a regular bumper cover, a replacement fender, and see what I can find for lights. For the center grille, I think I’ll try and emulate the three-bar grille the previous generation Flex used. I like the current front-end Flex look, but I don’t think I’ll be able to get lights that match quite like that, and that grille looks a bit complex for me to attempt to emulate. But, the previous-gen Flex, that’s different. That grille is three aluminum strips — I may be able to emulate that well. F L E X B. But first, I need to get the basics done. Get everything all cleaned out, bend the bent stuff back into shape, and start getting some parts to put back on. So, I’ll update on this unplanned project as soon as I can!